Zhang Yudrakpa Tsondru Drakpa, also popularly known as Lama Zhang was born in 1123 at Tsawadru in the valley of the Lhasa River south of Lhasa. Zhang Yudrakpa Tsondru Drakpa later became the founder of the Tsalpa Kagyu tradition of Tibetan Buddhism and a prominent religious figure, but his extensive involvement in the political and military conflicts of Tibet was controversial at the time. His family was a continuation of the Nanam Zhang clan, a noble family that in old imperial times intermarried with the royal family and served as ministers in the government. She kept her connection with her former convent, and would often take along the young Zhang, then known by his birth name, Darma Drak, to listen to discourses by the female teacher Majo Darma. When he was a little older he continued his studies under the tutorship of Sambu Lotsawa. During this time his parents died, and this threw him into a suicidal despair. He seems to have thought the bad karma of his black magic had something to do with their deaths. It was there that he took novice vows, and a year later he had a dream indicating a cleansing of his bad karma when a slimy snake-like creature slithered out of his body. In 1148 he took complete monastic vows, along with the name Tsondru Drakpa, which could be interpreted to mean "renowned for persistence." Go Lotsawa was a translator who had studied in India directly under the celebrated Indian teacher and author Abhayākaragupta (died in 1125) as well as under the Tangut teacher Tsami Lotsawa Mondrub Sherab. Go Lotsawa gave Zhang yogic instructions along with Cakrasaṁvara empowerments. He moved back to U intending to study further with Go Lotsawa, but ended up receiving teachings from other teachers instead, particularly Olkhawa Choyung (1103-1199) and Mel Yerpawa. It was at this time, around 1152, that Zhang first began to give teachings to gatherings of monastics and laypeople. At the time Gomtsul held the abbacy at Dansa Thil, making him the most important leader of the Kagyu, even if the Kagyupas were, at best, loosely organized in those days. Still, this was the time before people started being aware of any Kagyu sub-lineages, which meant there was a real sense of unity. During Lama Zhang's time with Gomtsul he had numerous meditative experiences and received the full Kagyu lineage and teaching authorization. This is when he composed what would prove to be his most widely read literary work, The Path of Ultimate Profundity. Lama Zhang was also a disciple of the Indian Dohā master, Vairocanavajra. As a universally respected religious leader, Gomtsul was called upon to mediate, and his efforts were met with success. After a few years of restoration work that included reassembling the stones into walls and decorating them with new mural paintings, Gomtsul made Zhang responsible for protecting Lhasa from further threats of violence and destruction. It was very likely because of fears of renewed fighting from the north that Zhang located his new monastery of Tsal Gungtang, established in 1175, just a short distance north of Lhasa on the opposite side of the Lhasa River. It had a very large and, in those days, famous Buddha image. He established control over much of U, which made him the most powerful ruler in Tibet at the time. He drafted his own set of laws. Of course even the slightest involvement in warfare provoked criticism and controversy among Tibetan Buddhists in his own times, and the controversy continue to this day. He was a descendent of a splinter line of the old imperial dynasty. “Some of the materials (labour, tools, etc.) used in their construction he collected, some were offered to him, and some he took as if by force. He repeatedly sent his armies to do battle against those who went against his commands. He performed all sorts of activities of spiritual accomplishment. Many years of my life have passed since I utterly cut off worldly connections, and I have constantly passed into the continuity of unborn space. I have laid down groundwork in the legal field, and it appears to them that such things as metal casting, housing, governmental laws, path seal, protection from stealing, and fighting battles are nothing but deeds of this world. He kept silent most of the time, but he did allow particular persons who were doctors, tailors, horse-keepers and sweepers into his retreat, not to mention the person responsible for the secular affairs of the community called the Ponchen. No other persons, not even the most important Kagyu teachers of his time, were allowed to approach his retreat place. At least one exception was made in 1189, when the First Karmapa, Düsum Khyenpa (1110-1193) travelled all the way from Kham in order to persuade him to put a stop to his militant activities. It is said that after hearing the Karmapa's arguments, Lama Zhang grasped the Karmapa's finger, danced wildly, and from then on abstained from violence. Other stories, however, indicate that Lama Zhang and the First Karmapa considered each other equals, and that his methods were not entirely frowned upon by his Kagyu colleagues. Lama Zhang entered, jumped on the Karmapa and slapped him 3 times. Before the guards could attack the Karmapa stated "Lama Zhang has just extended my life by 3 years!" Since its lower parts had already been completed, it was made first into a cremation platform, and later into a reliquary to enshrine his bodily remains. 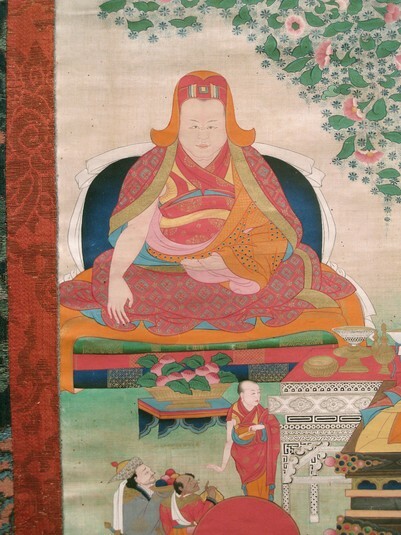 His disciple Nyamme Śākya Yeshe (1147-1207) succeeded him as abbot of Tsal Gungtang.